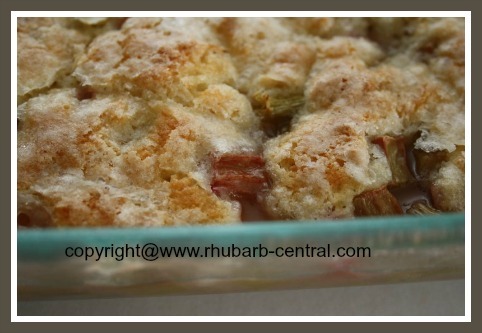 This Apple Rhubarb Cobbler Recipe (see the pictures! ), makes a delicious dessert in a 9" x 13" baking dish, and uses honey instead of granulated sugar. This recipe is made with whole wheat flour. This healthy cobbler recipe can also be made with just rhubarb by replacing the apple ingredient with an 3 cups of chopped /sliced rhubarb. 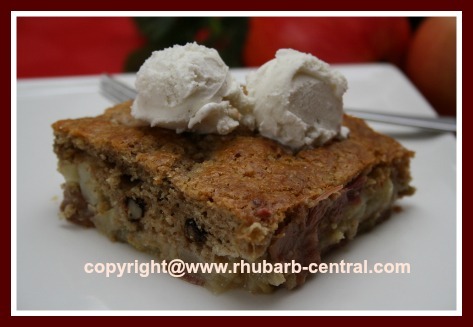 If you would like to make a Strawberry Healthy Rhubarb Cobbler using this cobbler topping recipe, simply substitute the apples with an equal amount of fresh sliced strawberries. Strawberries and rhubarb are a great combination too! Grease a 9" x 13" glass baking dish, (I used non-stick cooking spray). 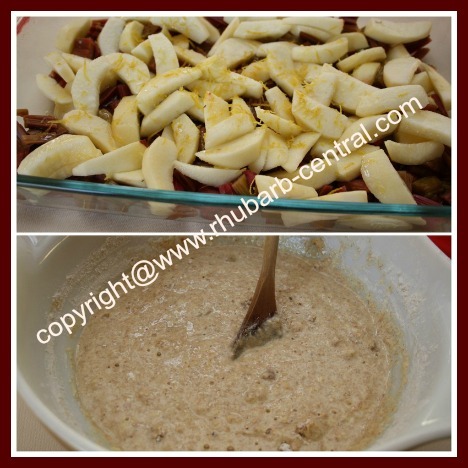 Add the chopped rhubarb and the sliced apples to the baking dish, arranged evenly. Add the grated peel on top of the apples and rhubarb, if desired. In a large mixing bowl, whisk together the egg, milk, melted butter, liquid honey and the lemon (or the orange) juice. Sprinkle the flour, chopped nuts, baking powder, baking soda and the salt on top of the egg mixture, but do not stir the dry ingredients in. Then, gently stir the flour mixture into the egg mixture using a wooden spoon, stirring only until just combined. Do not over-mix. 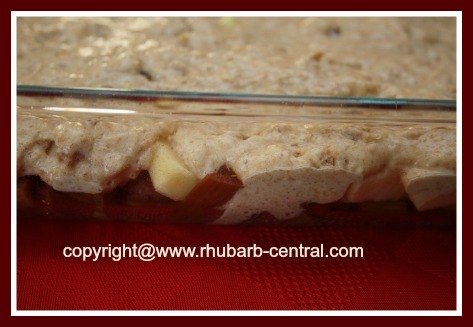 Pour the cobbler topping evenly over the rhubarb and apples in the baking dish. Bake at 375° F for about 30 - 35 minutes, or until a toothpick inserted into the center of the cobbler topping comes out clean. Serve cobbler warm or cooled with a dollop of ice cream, whipped cream, whipped dessert topping, or Greek Yogurt! 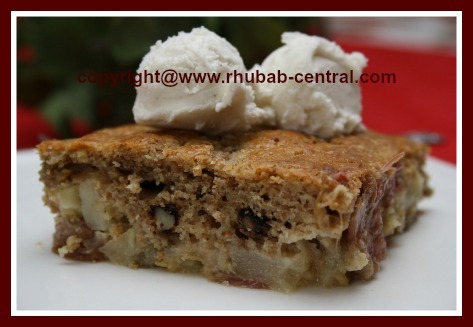 Or, enjoy this cobbler plain...this Apple Rhubarb Cobbler will still taste awesome! If you do not have chopped walnuts or other nuts for this recipe. You can easily chop the whole nuts without even using your blender. 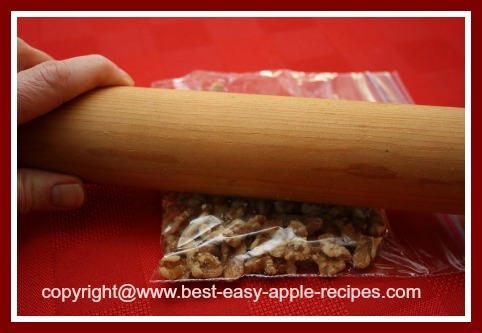 Simply place the whole nuts into a sealable bag, or between a piece of folded waxed paper, and run over the whole nuts with a rolling pin (see picture at right).